We all love manta rays. Scuba divers from all over the world count an encounter with a manta ray as a bucket list item. These graceful animals are one of the largest creatures in the ocean and yet are completely harmless. Unlike their cousins the stingray, manta rays don’t possess a barb on the tail. Belying their large size, manta rays feed exclusively on the smallest things in the ocean. Plankton, fish larvae, and other tiny animals are their main diet. Manta rays are found in all tropical and temperate seas world wide. As a cartilaginous fish, manta rays are closely related to sharks. There are two different species of manta rays, the Mobula birostris (Pelagic) and the Mobula alfredi (Reef). The pelagic mantas can grow up to 7 metres across while the reef species maxes out with a 4 – 5 metre wingspan. Although size is one obvious difference between them, other distinguishing characteristics include markings and habitat. As the “common” names suggest, reef mantas are found close to shore. Pelagic mantas, on the other hand, live in deeper waters and roam over a larger territory, but not too far. In Indonesia, we are lucky to encounter both species of manta rays, with reef mantas being more prevalent. 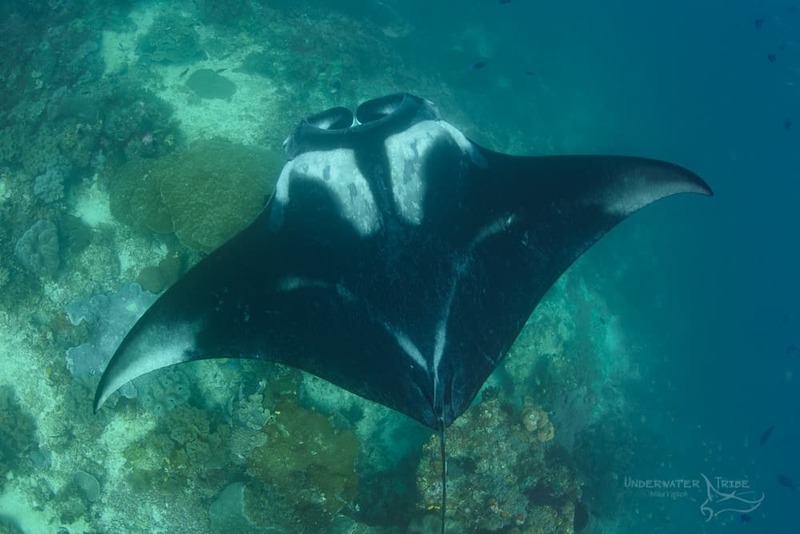 Sites such as Manta Alley and Makassar Reef in Komodo, Manta Point in Bali, and Manta Sandy in Raja Ampat are well known areas for reef mantas. Pelagic mantas are regularly visitors to sea mounts throughout the West Papua region. 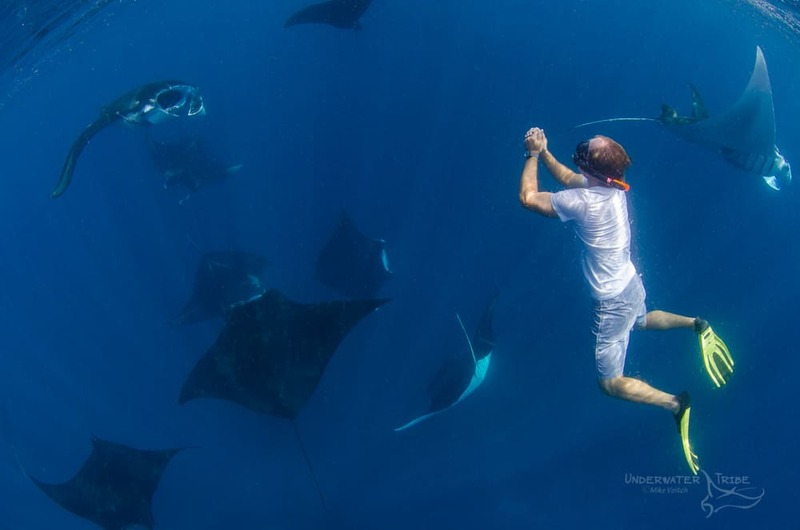 The most common sites to encounter manta rays are “cleaning stations”. Cleaning stations are areas where resident cleaner wrasse and other cleaner fish live. Manta rays visit these areas on a regular basis to have the “cleaners” pick parasites off their skin, mouth, and gills. The most dramatic way to encounter manta rays is when they congregate in large numbers to feed at the surface or attempt to mate. When feeding, mantas spread out in a vertical formation, one just above and behind another in order to “stream” off each other. It’s an amazing site to watch and best experienced by snorkeling. Mantas are intelligent creatures and will avoid swimmers (mostly!). When a mating dance happens, the energy rockets up tenfold! The chaos of mating sessions makes feeding look like a calm and orderly procession. The graceful movements of a manta ray disappear when dozens of males are chasing a female all throughout the water column. Mantas all have unique markings, the spots on their belly is their own unique “finger print”. It’s this fact that makes it easy for photographers to contribute to the “citizen science” of manta ray research. Researchers can often i.d. manta rays from a photograph, if the necessary elements are there. With this information, along with where and when the photo was taken, it’s easy to correlate if and where manta rays may be migrating. There are at least three organizations who offer manta ray identification services online: Manta Trust Manta Matcher and Project Manta. Each site explains the process very thoroughly and what sort of photos to submit. If you have photos of manta bellies from anywhere in the world, feel free to submit them! Interested in encountering mantas yourself? Why not join us on a Bali Safari? We regularly visit Manta Point in Nusa Penida where reef mantas are present all year long. 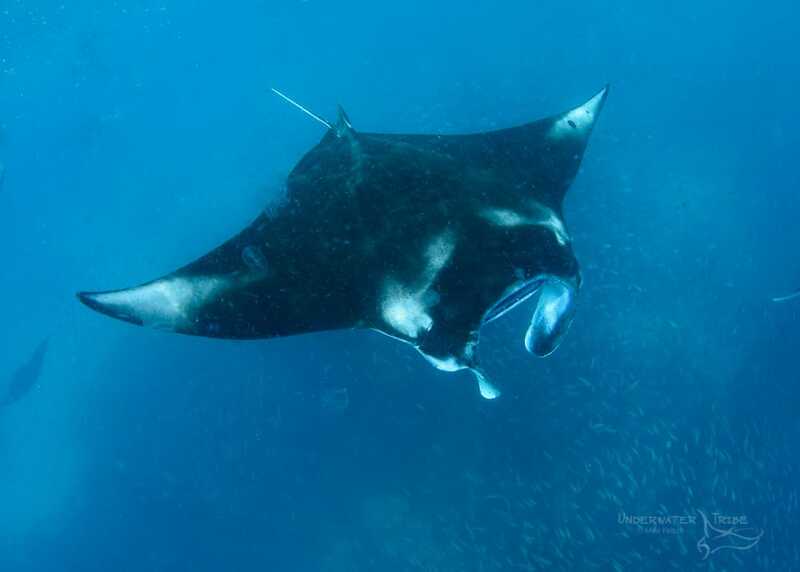 If you prefer liveaboard diving, Raja Ampat is an amazing destination for manta ray encounters as well, join us in 2020.